When her father is murdered for a journal revealing the location of a hidden gold mine, eighteen-year-old Kate Thompson disguises herself as a boy and takes to the gritty plains looking for answers-and justice. What she finds are untrustworthy strangers, endless dust and heat, and a surprising band of allies, among them a young Apache girl and a pair of stubborn brothers who refuse to quit riding in her shadow. But as Kate gets closer to the secrets about her family, a startling truth becomes clear: some men will stop at nothing to get their hands on gold, and Kate's quest for revenge may prove fatal. At first glance, I would not have pegged this book as an "Emily Read". I've been rather picky of late, and to top it off, it was a print book. I can't tell you how long it has been since I sat down with an actual book. Been rocking the audiobook option though. Marketed as True Grit for teens, this one definitely stands out since you don't see too many westerns in Young Adult literature. Here's the gist...Kate Thompson lives with her father on a ranch on the harsh Arizona landscape. One day she comes home to find her father murdered and her home burnt down. Knowing its dangerous for a girl to travel alone in the Wild West, she disguises herself as a boy and sets out after the murderous band known as the Red Rose Gang. Along the way she discovers some heartbreaking family secrets, meets someone who can tame her wild heart, and finds an unexpected friend. 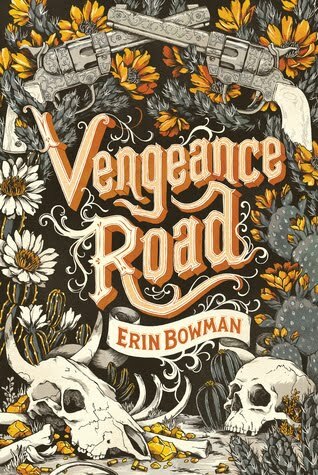 There were a few twists and turns that I didn't see coming, and I loved the language and tone of the story, feeling very much like a movie that should probably have John Wayne in it at some point. Kate is stubborn, confident, and fierce. And I loved her. Sure, she was blood thirsty, her heart beating only for revenge, but she never backed down from a fight, and she never let anyone think she couldn't stand up for herself because she was a girl. Best of all, she grows throughout the book. Realistically. Without losing who she is and maintaining that fierceness that makes her so special. There's adventure. There's shoot-outs. There's hidden gold. There's a bit of romance. And there's a female protagonist you're cheering for from page one. Can't recommend this one enough!